The background I made with a Papertrey embossing plate, over which I sponged distress ink. The bird I colored with watercolor. The sentiment is by STAMPlorations from the brand new set Noteworthy. By the way - you still can get all the new sets for 10% off and there is free worldwide shipping until April 10th! - Perhaps you want to take advantage of that! oooooh!!! Da hat dich die Muse aber heftig geküsst!!! Ich liebe diese verrückten Vögel, leider sind sie bei uns in den Läden gleich immer vergriffen. Your crazy bird is fantastic!! I love all the color contrasted with the black and white stenciled background. Diese Vögel sind wirklich total witzig! Du hast deinen so schön koloriert und vor dem Hintergrund sieht er super aus! Vielen lieben Dank für deine schöne Osterkarte! coole Karte, die rays sind immer ein genialer Hintergrund! Das Federkleid was du dem Vögelchen verpasst hast sieht auch super aus! the lady at Stempeloase must waiting for the next versand nach Munich and your CASE ing Vicki card AMAZING totally in love and great idea you always have..how clever you are change the black part at the top area of your card...Good luck with the MUSE challenge liebe Cornelia..
Love the colouring on both birds and the backgrounds look superb. Fabulous card! You've colored beautifully. I'm still waiting for my birds. Der denkt wohl er wurde ins All geschossen *hahaha* Super gemacht! And there you are!!! Oh how cute is this guy? Very, very... Cornelia! Thanks for playing cards with us this week - I'm betting all of your friends here will be excited to join you! Beautiful coloring on your bird...wow! Great take on the Muse card, too! 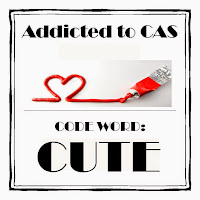 Thank you so much for playing along with us this week at Addicted to CAS! Love this fun take on Vicki's card - that sunray background is awesome! So glad you joined us at Muse this week! 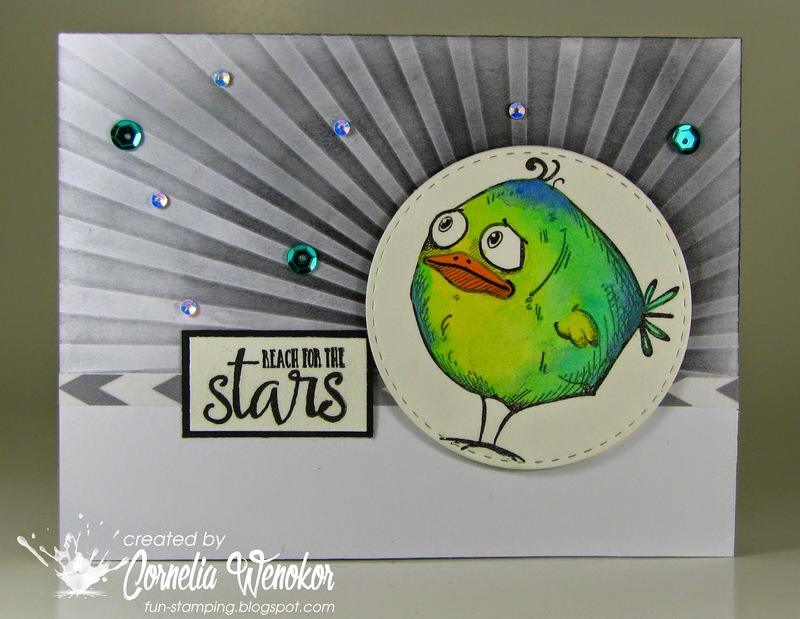 Brilliant take on Vicki's card with your delightful water-coloured bird (he's a cutie, with his 'round-y') physique! Absolutely darling! Fabulous card...just too darn cute! Fabulous take on VIcki's card. That ray burst is perfect with the crazy bird! Das sind ja zwei herrlich schräge Vögel, ich mag sie beide!! Hach, die liebe diese verrückten Vögel. Vor deinem schwarz distressten Hintergrund wirkt der grüne Piepmatz gleich nochmal so toll. Vielen Dank fürs Mitmachen bei der Stempelküche-Challenge. i just love the sunburst pattern around your bird!!!!!! great take on the MUSE challenge! Like you case Vicki's card! The sunray background above this crazy bird is so clever! So adorable and I love your interpretation of the Muse inspiration card. Top 3 bei der Muse Challenge - yeah! Come and Celebrate with Me!